Rogozin, banned in Norway and other western countries due to his role in the Ukraine crisis, set off a diplomatic furor with his arrival in Longyearbyen at midday Saturday via a direct flight from Russia, thus bypassing passport and other security checks due to the terms of the Svalbard Treaty. Norwegian officials, who learned about his visit after media inquiries Saturday evening, summoned the Russian ambassador in Oslo for an explanation Monday and are considering imposing stricter entry requirements into the archipelago. He also stated Rogozin and his delegation landed in Longyearbyen, instead of flying directly to a Russian ice camp near the North Pole as many other planes from the country do at this time of year, due to bad weather. Norway’s Foreign Minister Børge Brende told the Norwegian News Agency Rogozin’s visit was not illegal under terms of the treaty, but Russia was told explicitly “there shall be no doubt that people on the sanctions list, people that have been central in breaching international law in Ukraine, are not welcome to the mainland or to Svalbard.” As a result, Norwegian officials will evaluate what additional restrictions can be imposed to such persons under terms of the treaty. Rogozin, deputy prime minister since 2011, was one of seven top Russian officials sanctioned by U.S. President Barrack Obama following the Crimean referendum in March of 2014, with the EU and other countries following suit. 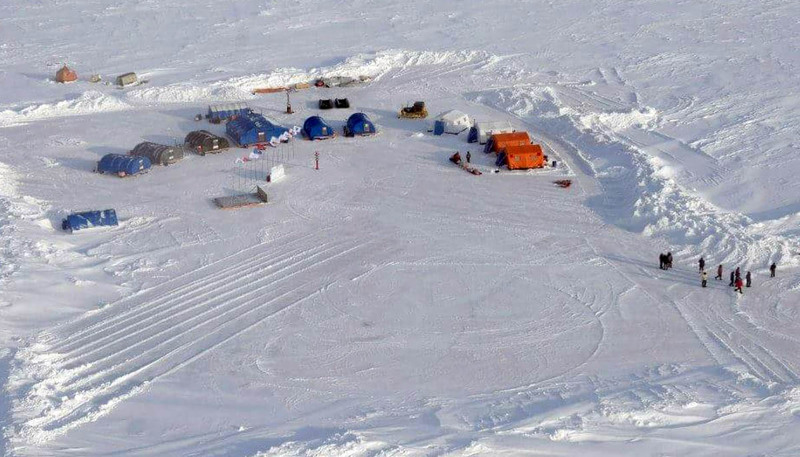 A military camp on an ice floe near the North Pole is a new supplental addition to a camp for scientists and expeditions constructed during the spring by Russia for many years. Photo by Dmitry Rogozin. 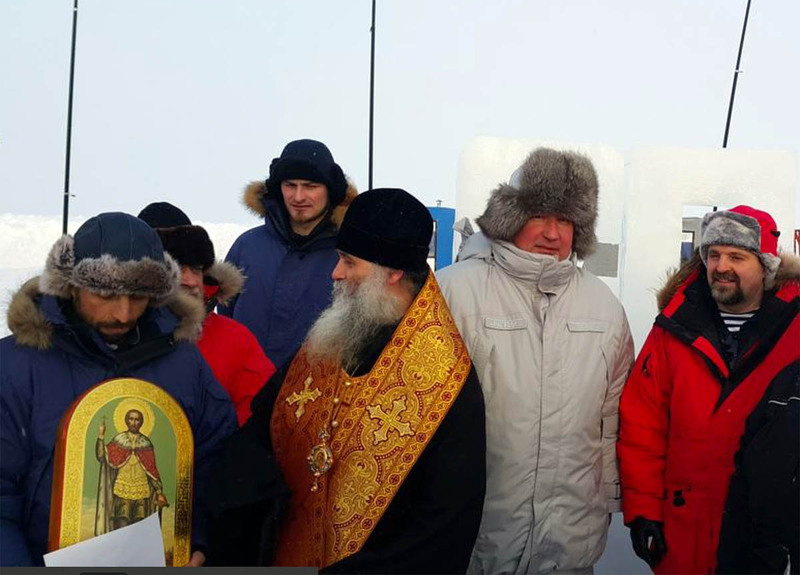 Rogozin, after sending a Twitter message announcing his arrival and a picture of himself at Svalbard Airport, spent Saturday afternoon touring the Russian settlement of Barentsburg. On Saturday evening he flew to a base camp on an ice floe at roughly 89 degrees latitude north to preside over an official opening ceremony for the “North Pole-2015” base, where military troops are engaging in extreme cold weather exercises. Similar sentiments were expressed by Rogozin last year in the introduction to a Russian book about territories the country lost in North America – notably Alaska – during the 19th century. “Russia giving up its colonial possessions makes it necessary to look in a different way at our diplomacy in the era of Gorbachev and Yeltsin, trading away pieces of the Soviet Empire,” Rogozin wrote, referring to the breakup of the Soviet Union into independent countries. In his speech at the Pole, Rogozin said Russia’s modern leadership has moved well beyond such attitude and claiming – or reclaiming – territory rightfully belonging to the country. That “area” has been the subject of heated dispute among the five countries with Arctic territory claims, with numerous battles being fought over the boundaries defined by offshore continental shelves. Last year, Moscow filed claim to an additional 500,000 square miles of Arctic territory, while Canada and Denmark also recently filed claims to large tracts of sea that venture beyond the North Pole. But Russia’s claims have been accompanied with aggressive and provocative military activity, including nuclear-related fighter jet and submarine incidents incurring into foreign territory. Earlier this month, all five Nordic countries — Iceland, Denmark, Norway, Sweden and Finland — reached an agreement to expand cooperative defense efforts due to Russia’s actions. “Russia’s leaders have shown that they are prepared to make practical and effective use of military means in order to reach their political goals, even when this involves violating principles of international law,” the countries’ defense ministers wrote in a joint statement. Rogozin, deputy prime minister since 2011, was one of seven top Russian officials sanctioned by U.S. President Barrack Obama following the Crimean referendum in March of 2014, with the EU and other countries following suit. The deputy prime minister is occasionally mentioned as a possible successor to Russian President Vladimir Putin is he chooses to step down in 2018, although analysts have suggested such an acsention is unlikely.